My personal tips on how to travel/ live in India. Read these articles and find out what awaits you in this 1.2 Billion people country. Most of the scams in India are innocent – they will not endanger you but only make you pay something more than it’s worth. Free-gift scam- someone approaches you and offer to do the Henna (natural tattoo) for free because they like you or you’re their first customer today. They might offer any other service as well. After drawing few lines with Hanna they say that next few lines will cost you only 100 Rupees. And you realise that there is no such thing as a free lunch in India. Word of warning- sometimes extra taxis will be applied but that should be clear to you before you purchase the product or service. This is my experience so please use it as a warning. I came to Delhi in the middle of the night by plane. I had a hotel pre booked so I felt safe. You have 2 options, to use regular taxi or a pre-paid taxi service. I was advised to use the prepaid taxi and that’s what I did. I asked the taxi driver if he knows the place I’m going to (hotel name) and he affirmed that he does. When we started our ride he asked me if this is my first time in India. I said “yes” and that was a big mistake. I should have said third time or something like that. After some time of driving the driver says he doesn’t know where the hotel is. Funny thing about Delhi and India in general is that there are no street address. Our hotels address was “near main railroad”. If taxi driver knows this is your first time in India he will take you to some tourist office where they will try to sell you another hotel, maybe even lie that your hotel is closed. In my case the hotel was really closed, at least for me. The owner decided to sell my room to someone else although I paid it in advance. 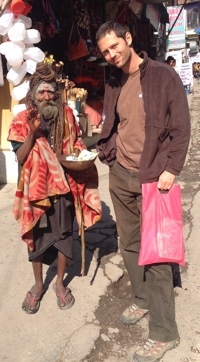 To cut the story short, I couldn’t find alternative accomodation in Delhi under reasonable price so I went to Rishikesh. Take pre- paid taxi. You’ll get a receipt which you need to keep until the driver brings you to the destination, than hand it to him. He will get paid only if he returns with the receipt. My driver asked me for receipt as soon as we left the airport and I was naive to hand it to him. Don’t accept any detours to tourist offices, other hotels etc.